There’s no twelve-step program for recovering psychics, but Detroit mechanic Sydney Hoven has been working hard on her supernatural sobriety. Too bad Hell didn’t get the memo. When Syd meets Devon on her first night back out, she doesn’t have to be psychic to see ‘really bad idea’ written all over his stunningly gorgeous face. He says an Archangel wants her protected. But why? When one of Lucifer’s lieutenants is sent to kill Sydney, the demon might be too strong for even Devon and the angelic forces he represents. With no true allies, Syd must stand on her own, destroy the demon, and claim her power. Otherwise, staying supernaturally sober might just kill her. 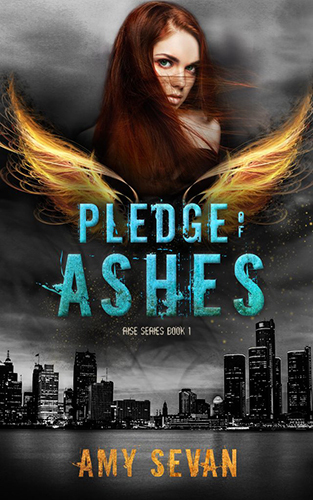 Pledge of Ashes is the first book in the Rise urban fantasy series that features angels and demons, men who have no business looking that good, and a female heroine who is learning to wield incredible power. Come visit Detroit after dark. Discover Pledge of Ashes today. Join the newsletter to get the latest news.